Red Feathers is a small, compact, evergreen perennial. It produces a mound of dark green, linear leaves. Feathery, upright plumes of russet-red flowers bloom in spring, re-blooming again in summer and fall if deadheaded. This isn't a long-lived plant, but it's worth planting for its bold flower color and long blooming season! It makes a colorful filler between grasses and shrubs on dry banks and its small size means it will fit into most gardens. The flowers provide nectar for bees, butterflies and other beneficial insects, so it's also a good plant for habitat gardens or for attracting pollinators to your veggie garden. Red feathers was a 2010 introduction by Plant Select, a collaborative program between the Univeristy of Colorado and the Denver Botanic Garden. The program aims to seek out good-looking, low-water, plants that perform well in the Rockies and other inter-mountain areas. Many of the Plant Select plants also do particularly well in the greater San Francisco Bay area and Central Coast. Red Feathers is native to a small area of the Caucasus Mountains in Northern Iran where it grows at altitudes between 60 and 2,200 meters. In Iran, red feathers is called gol-gav-zaban which means "cow-tongue flower" and refers to the similarity between the feel of a cow's tongue and the rough, bristly surface of the plant's leaves. The genus, Echium, is derived from the Greek word echis, which translates as "viper." This may refer to the shape of the seed which resembles a viper's head. Alternatively, it may refer to an old belief that Echium vulgare, a close relative of Echium amoenum, was a remedy for the venomous bite from a viper. The specific epithet amoenum is from the Latin word amoenus meaning beautiful or pleasing. Red Feathers is an evergreen perennial. It forms a compact clump of medium green foliage about 4" tall and 6-8" wide. The leaves have short bristly hairs on the upper surface which makes them rough to the touch. In spring, upright flower stems emerge. Each one grows to about 10-14" tall and bears plumes of rusty-red flowers. If you're able to deadhead the flowers, blooming should continue on into summer or even fall. Red feathers isn't long-lived, but it will self-seed a little. At the end of the blooming season, leave a couple of flower spikes on the plant until they've dried and the seeds have dropped. This should ensure you always have new plants coming through. For the best display of flowers, plant red feathers in a spot where it'll get at least half a day of sun. 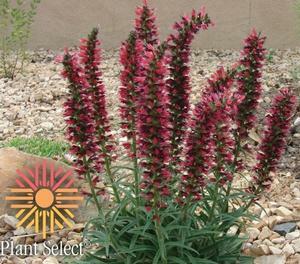 Red feathers is an adaptable plant and will grow in many soil types from quick-draining sandy soils to heavier clay. Just don't plant it in a location where it may be sitting in water for more than a day. Depending on your location and the amount of rain that's fallen, you may be able to get away without watering red feathers at all once it's established. If necessary, though, it'll be perfectly happy with regular water during the summer. Remember that infrequent deep waterings are usually better than frequent shallow waterings. Deep infrequent watering encourages plant roots to grow deeper in search of water and will help them become more drought-tolerant. Frequent, shallow watering means the water just stays in the top couple of inches of soil, so plant roots don't have any reason to grow much deeper. Red feathers provides nectar for bees, butterflies and other pollinators and beneficial insects. The flowers and leaves of this plant have traditionally been used medicinally as anti-febrile and anti-depressive treatments, for the treatment of stress and anxiety and as a laxative (S. Gholamzadeh, S. Zare and M. Ilkhanipoor, 2008. Effect of Echium amoenum (Gol-gav-zaban) on Motor Coordination in Rat During Two Treatment Courses. Research Journal of Biological Sciences, 3: 179-180). Red feathers can be grown fairly easily from seed. Germination can be erratic and happen over a relatively long period of time. Don't throw out your seed trays prematurely and don't leave the trays in direct sunlight where the soil can become too warm. Germination is better at lower temperatures (around 40-45°F / 5-7°C), so you may get better results by sowing seed in winter. Regular deadheading (cutting off dead flower spikes and their stems) will prolong the blooming season. No regular maintenance is needed on the foliage.